The Lahontan cutthroat trout (Oncorhynchus clarki henshawi), also known as the black spotted trout by the Paiute Indians, once flourished throughout the basins of Pleistocene Lake Lahontan. The trout reached epic sizes as Capt John Fremont recounted that the Paiutes brought Lahonton trout to his camp in 1843 which he wrote "Their flavor was excellent--superior, in fact, to that of any fish I have ever known. They were of extraordinary size--about as large as the Columbia River salmon--generally from 2 to 4 feet in length." Based upon a specimen caught in Lake Tahoe in 1878, the fish was named Salmo henshawi in reference to H.W. Henshaw, the naturalist who caught the fish. Since then, the name has been refined to Oncorhynchus clarki henshawi to reflect it as a Cutthroat subspecies. The world record for a caught Lahontan is 41 pounds in 1925 although one Lahontan Cutthroat was caught by a Pauite Indian in 1916 and weighed 62 lbs, both fish were caught in Pyramid Lake, Nevada. The California record is 31 pounds in 1911 at Lake Tahoe. Lahonton cutthroats historically occurred throughout the Walker, Carson, Truckee, and Honey Lake drainages including Lake Tahoe, Donner, and Fallenleaf Lake. Today, the Lahontan population is restricted to 14 streams in the Lahontan drainage with about 23 miles of occupied habitat, as well as 720 acres in Independence Lake. Presently the population consists of less than 10,000 adult fish. The Lahontan cutthroat trout is a federally listed Threatened species due primarily to overgrazing along streams and loss of spawning streams due to dam construction. The Lahontan Cutthroat has been extinct from Lake Tahoe since the 1940's. An active hatchery program exists at Heenan Lake using Lahontan Cutthroats that were transplanted from the Carson River to Blue Lakes in 1864. The fish became slightly hybridized with rainbows and were brought to Heenan Lake to raise hatchery-born cutthroats to stock in many of the lakes and streams throughout the Sierras. None of these restockings have been successfull in achieving a self-sustaining population. Lahontan Cutthroats can be recognized by their greenish bronze color of the dorsal region and the light yellowish copper coloration of their sides. A pale reddish slash mark will be found under each side of the jaw. Large round black spots are evenly distributed on the sides of the fish. 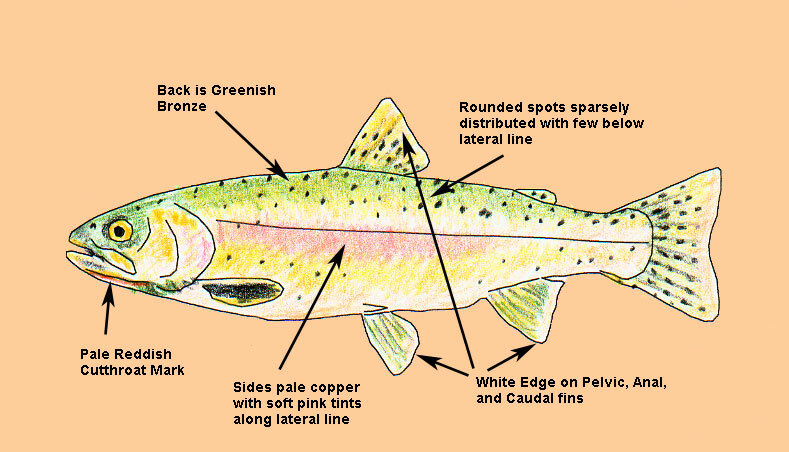 These spots may also be found on the ventral and head regions of the fish.